This past Wednesday I made another bread pudding. As I mentioned in the last post I had a gang load of bread that I had brought home from work with every intention to use as much of it as possible for bread pudding. The last recipe I used turned out.. good... I think. I actually didn't get a chance to taste it myself but others who had told me it was good despite it being underbaked. The recipe was a bit more fussy than I wanted so for my second attempt I turned to the next best source next to my cook books: The Food Network's website. Sometimes I get worried getting recipes from there because it's proved displeasing on several occasions but I also got the easiest and best Banana Bread recipe from there as well so I gave it a go. 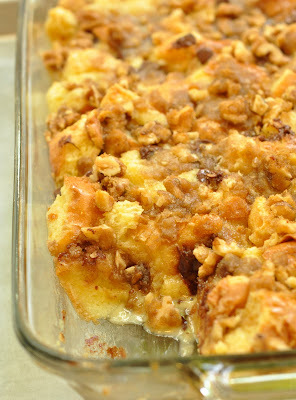 I came across Paula Dean's recipe for bread pudding. Anyone who's watched even a bit of Paula Dean knows that she's infamous for all of the butter an sugar she puts in her recipes. So after carefully reading the reviews, I decided to take some of the advice of the negative ones and cut the sugars in half. Preheat the oven to 350 degrees. Grease a 13 by 9 by 2-inch pan. Put the bread into the pan and evenly spread the chocolate chips with the bread. In a bowl add the eggs and beat together. Add the sugar then cream then the Triple Sec and vanilla. Pour over cubed bread. Let sit for 10 minutes. Sprinkle brown sugar mixture over the top and bake for 35 to 45 minutes, or until set. This recipe was super easy and super delicious. Alcohol always seems to elevate dessert to a higher level. I added some Triple Sec in it just for the heck of it and it was GENIOUS!!! As soon as I took a bite, I tasted the Triple Sec and man, OH MAN it was so good!!! It was fine without the sauce that Paula Dean used. But I did make a chocolate sauce that gave it a bit more oomph. Melt together in a bowl in a microwave in 20 second intervals until just melted together stirring between. My small group loved it and what's more, my brother loved it! It's rare that he loves something I make (besides chocolate mousse) SOOOO much that he goes looking for it. Whenever I leave Red Velvet Cupcakes he always tells me he forgets to eat it. This recipe is a winner for sure.. tweaked. Today was a baby shower for a couple at my church I adore very much. Kevin, the father-to-be, is very much like my older brother. And Debbie, the mother-to-be, has been a great ear for me giving me her advices. I was commissioned to make the thing I get asked to do the most: Red Velvet Cupcakes. Also, I was asked to make some cookies as party favors. 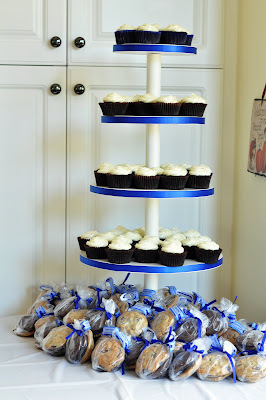 I thought it would be a fun idea to make the cupcakes into Blue Velvet Cupcakes since they are having a boy. Sounded easy enough.. just add blue food coloring, right? I will quote something our loving pastor said, "Nadia, why are the cupcakes gray?" It tasted great, that's all that really mattered. 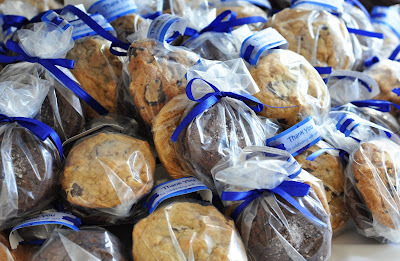 For the favors I made my favorite Chocolate Chip Cookie recipe by Sherry Yard and a Chocolate Sea Salt Cookie. It's pretty easy and delicious. Not for the kids... the chocolate is intense and the salt is unexpected but goes so well together.